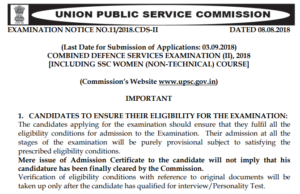 UPSC CDS 2 2018 Online Form: 414 Vacancy Last Date Sept. 3 – Union Public Service Commission has already confirmed that after 3rd September 2018, it will not accept the single UPSC CDS 2 2018 Online Form. 20 Years of Minimum Age and 25 Years of Maximum Age limit is mandatory for those who are willing to join the Combined Defence Services Examination. Besides, Educational Qualifications – Graduate Degree from Recognized University (in accordance with respective posts) are mandatory to go through. For General and Other Backward Class Candidates, Rs. 200/- is the Application Fees and Rs. 100/- is the UPSC CDS II Registration Fees for Scheduled Tribe, Scheduled Caste, Females and Persons with Disability. Reportedly, there are 100 vacancies of Indian Military Academy (IMA), Dehradun; 237 vacancies of Officers Training Academy, Chennai (OTA); 32 vacancies of Air Force Academy, Hyderabad (AFA) and 45 Vacancies of Indian Naval Academy (INA), Ezhimala. For all these vacancies SSB (Service Selection Board) interview is mandatory to go through. SSB Interview is the phase 2 of the selection procedure. While Document Verification/ Medical Test is the phase 3 of a selection procedure. Last Date to Pay Fees is in the month of September 2018 only. While Admit Card of UPSC CDS II Examination will be released almost a couple of weeks prior to the date of examination. 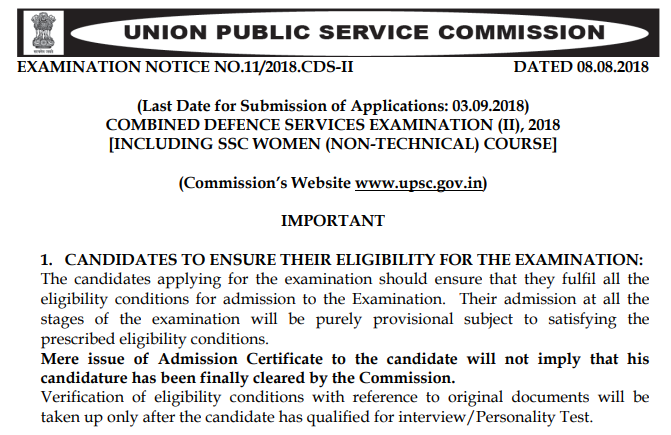 Keeping UPSC CDS II 2018 Official Notification PDF in mind, Date of Examination is 18th November 2018. In this official recruitment notification PDF, vacancies are unequally divided between – Indian Military Academy, Dehradun – 147th (DE) Course commencing in July 2019 (including 13 vacancies reserved for NCC ‘C’ certificate (Army Wing) holders), 45 vacancies for Indian Naval Academy, Ezhimala – Course commencing in July, 2019 executive (General Service)/ Hydro (Including 06 vacancies reserved for NCC ‘C’ Certificate Holders (Naval Wing)), 225 vacancies for Officers’ Training Academy, Chennai (Madras) – 110th SSC (Men) course (NT) commencing in October 2019, (including 50 vacancies for NCC ‘C’ Certificate Holders for NCC Special Entry) and 12 vacancies for Officers’ Training Academy, Chennai – 24th SSC Women (Non-Technical) Course commencing in October 2019. Besides, those who are looking to join Air Force Academy should keep in mind that only 32 vacancies are there for AFA Hyderabad – (Pre Flying) Training Course commencing in July 2019 i.e. No. 206 F (P) course. [03 vacancies are reserved for NCC ‘C’ certificate (Air Wing) holders through NCC Special Entry]. For UPSC CDS 2 2018 Online Form latest news, please visit ALLINDIAROUNDUP portal.